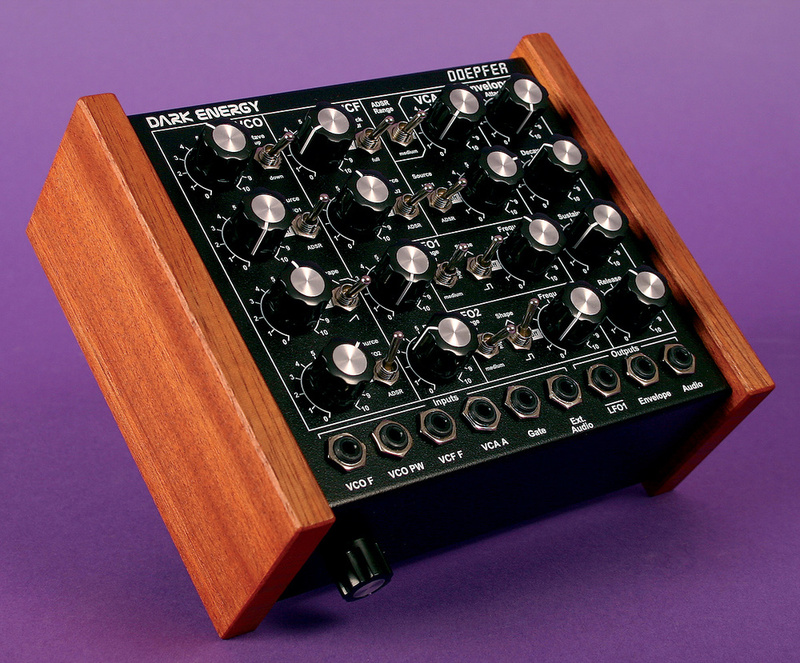 The latest product of Doepfer's modular know-how is the Dark Energy: a compact, powerful and hands-on desktop analogue synthesizer. As with the rest of the instrument, 3.5mm jack sockets are very much the order of the day on the rear panel, the only exceptions being the power, MIDI and USB connectors. Also, note the MIDI Learn button. In a departure from the more familiar silver, the Dark Energy is clad in chunky black steel and protected by wooden end cheeks. It looks fab! The knobs are a step above any Doepfer I've met, being classy in shape and handling. They are rather too close together for an unreserved thumbs-up but, being reassuringly heavy, they aren't prone to unintentional disturbance. There are 16 knobs on a standard Dark Energy. An optional glide control knob costing £20$20 was also present on the front of the review unit. Had it been placed at the rear, along with the MIDI input, wall‑wart connector, USB port and outputs from the MIDI-CV converter (about which more later), the synth could have been operated upright rather than on its back. Glide is too important to be considered optional — how else will we recreate those 303 bass slides? As well as knobs, there are a dozen three‑way switches which have two active selections each, the middle position typically being 'do nothing'. This Dark Energy is considerably less enigmatic than its namesake, the mysterious something that occupies the majority of the universe. Actually, we've heard from it before. At its heart beats a Curtis chip (CEM3394) previously found in synths such as the Sequential Circuits Multitrak and Six‑trak. It's been a long time since I (briefly) owned a Six‑trak, and I don't remember it sounding this good! 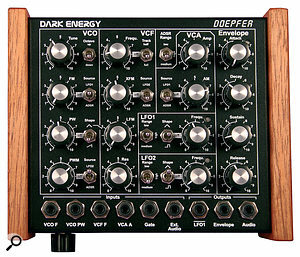 Maybe a few knobs and patch points have turned my mind, but it appears that Doepfer, in his mad-scientist lab coat, has dipped the chip in acid — or maybe acieed! The 24dB/octave filter should certainly test the ears of those who adamantly declare that only discrete circuits can sound sweet. With its pleasing, even response and a resonance that wails like a tripping ocelot, the filter should serve as a potent reminder that real analogue isn't pushing up the daisies just yet. Having made the obligatory 'yeeow' noises, it was time to probe the filter's repertoire further. A tracking switch offers half, full or no tracking at all. If you activate tracking with resonance at self‑oscillation, you can play the resulting sine wave as a pitched audio source. So far, nothing too extraordinary. The filter is modulated by either the ADSR or LFO2, its amount set by the XFM (exponential FM) knob — again, typical enough. The scope for freakier electronica comes courtesy of an internal signal path patching the VCO's triangle wave as a modulation source for the filter. With no noise generator present, filter FM is quickly adopted as one of the main ways to inject some grit. The VCO is as simple as they come. A switch transposes its pitch up or down an octave, and there's a fine‑tune range of around plus or minus five semitones. 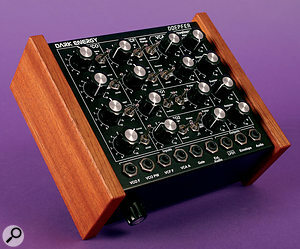 Unlike some single-VCO synths, the Dark Energy has no sub‑oscillator, yet it doesn't feel weedy or lacking in oomph. It can deliver profound sub‑bass or, with a few masterful tweaks, become a rasping, spitting cockroach, especially when the aforementioned filter FM is cranked to the max. VCO waveform selection is slightly unconventional. A switch offers the choice of triangle, sawtooth or off. Then, to mix in a square wave, turn the pulse-width control away from either extreme. As you turn the knob towards the middle of its travel, the wave widens into a warm, hollow square; keep turning and it becomes progressively thinner until it disappears. There is no way to set the levels of the VCO waveforms other than by this pulse-width adjustment. Pulse‑width modulation is sourced either from the envelope or from LFO2. 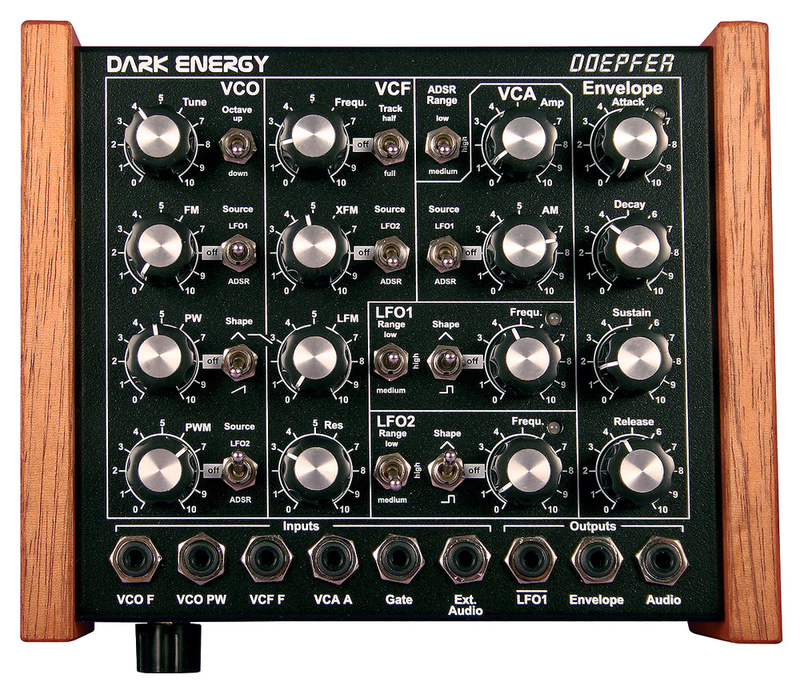 The Dark Energy has three internal sources of modulation: two LFOs and an ADSR envelope. The LFOs offer just triangular or rectangular waveforms and each has a red/green LED, the colours shifting to track the phase of modulation. Low, medium and high frequency ranges may be selected, the latter hoisting LFO frequency to around 5kHz. Modulation at audio rates is your ticket to pseudo-ring‑mod atonality, whilst the slowest ("up to a minute”) LFO speed is ideal for those slothful moments. The envelope is entirely conventional, with just one slight twist. It has three operational ranges scoped for precise, short envelopes, envelopes suitable for solos or general performance, and long drone‑type settings. Droners everywhere take note: the maximum attack time is almost a minute. Measuring approximately 185 x 145 x 65mm, the Dark Energy should fit comfortably on to anyone's desk, no matter how cluttered. Although it is patched internally, the Dark Energy's horizons are broadened considerably by means of patch points — voltage inputs and outputs, some of which are sourced from MIDI. The CV inputs are as follows: VCO frequency, VCO pulse-width, VCF frequency, VCA amplitude and Gate. An audio input is present, too, for processing external signals via the filter. The outputs from LFO1 and ADSR are delivered to the front panel's mini‑jacks as control voltages, along with the main audio signal, while the MIDI‑derived CV outputs appear on the back panel. The more common Volt/octave CV standard is employed, and Doepfer kindly provide a mini‑jack to quarter‑inch conversion lead along with a couple of patch cables to get you hooked. I mean started. CV/Gate connectivity is expected on a Doepfer synth, but the inclusion of MIDI and USB really opens up the interface. Getting started with MIDI couldn't be easier. Assuming we're using the five‑pin kind, send some notes from your controller. Thanks to the handy 'learn' button, the Dark Energy will memorise the channel of incoming data and store the continuous controller you most wish to turn into a CV output. This is MIDI‑CV interfacing without the head‑scratching, and Doepfer should be applauded for making it so. Connecting with USB is equally easy. Assuming you are running Windows XP (SP2 or higher), Vista or Mac OS X, plug and play should do the job nicely. On my system, Dark Energy adopted Microsoft's driver and appeared as a 'USB Audio Device', but both Vista and OS X should list the synth by name. The MIDI interface generates gate signals to drive the envelope generator, as well as four other control voltages. Of these, CV1 is extracted from MIDI notes (and routed internally to VCO pitch), CV2 corresponds to pitch‑bend and CV3 is note velocity. CV4 is initially assigned to mod wheel, but you can specify another controller. Setting up mod‑wheel filter sweeps is as simple as connecting CV4 to the front‑panel VCF input. An internal arpeggiator is brought to life by a MIDI program change. The arpeggiator can sync to external clock, and although it isn't full of treats, is a fun trinket nonetheless. Program changes are used to select other functions such as envelope retriggering and the assignment of some of the voltage outputs. Should you be comfortable with the idea of poking around inside your gear, a degree of customisation is yours for the taking. We've already seen that a glide control can be added if you have the skills; the same goes for a MIDI Thru port, and a technical information booklet is supplied describing how to achieve this and other mods. One bonus of implementing a Thru connection is that multiple Dark Energies are supported. Each in the chain subtracts the notes it plays from the MIDI stream before passing it to the next, raising the tantalising possibility of multiple synth voices played polyphonically. Or of multitimbral performance. It's unpretentious, well‑constructed and welcoming, and I couldn't help but enjoy basking in Dark Energy. The Doepfer brand might seem scary to newcomers, synonymous as it is with powerful, potentially unfathomable modular behemoths. But a synth the size of a sandwich box won't intimidate anyone. Plus it's hardly a massive leap into the unknown, which is probably why the Dark Energy succeeds despite being fairly basic in spec. In times gone by you would have hoped for a noise generator, more LFO waveforms, a sub-oscillator or even a second envelope in your monosynth. Today's virtual analogues have these things stacked higher than a dentist's Reader's Digest pile. And even hybrid instruments with analogue filters and oscillators gain extra advantage from software LFOs and envelopes, not to mention menus and memories. 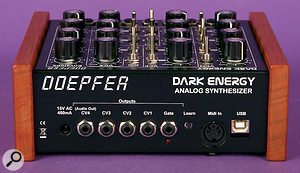 Doepfer's approach has been to keep everything in the analogue domain, which keeps things simple. Although the Dark Energy can't collide large hadrons or provide affordable cold fusion, it will generate analogue fizzes, zips and blips for those who appreciate them. Personally, I'd have liked a few extra millimetres between adjacent controls to eliminate the fumble factor — or sufficient panel space to fit a glide control. But no doubt the small format will be a bonus for many. 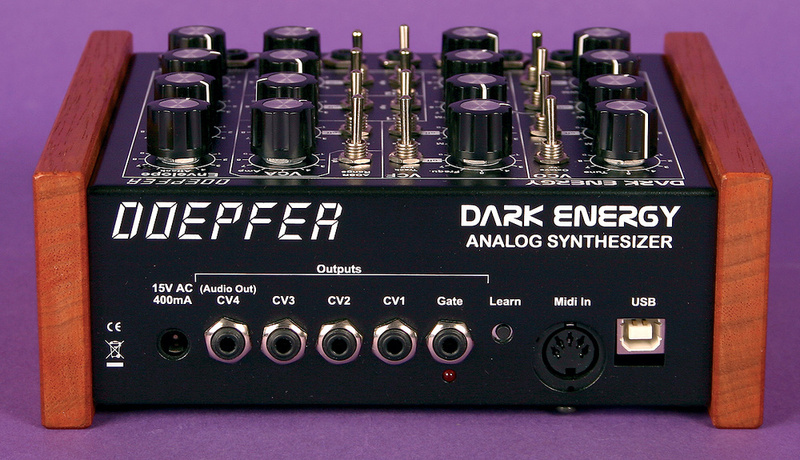 With an eye on cost, Doepfer have produced a modern 'no frills' analogue synth that could earn a niche in many studios and live rigs. Equally at ease with voltage, MIDI and USB, Dark Energy is out there but I doubt it will remain unknown for long. Another German company, MFB, offer a range of small MIDI‑controlled analogue synths. In the case of the larger three‑VCO 'Kraftzwerg', patch points are offered too. But the affordable end of the market is currently dominated by Dave Smith Instruments, whose Mopho and Tetra synths offer plenty of bang for the buck. Also driven by Curtis chips, these both have memories and a menu‑based user interface, but no patch points. For patching without going fully modular you should check out the more expensive SEM (Synthesizer Expander Module) from Tom Oberheim, a welcome blast from the past that is now available in MIDI or patch-panel format. Small, self‑contained real analogue monosynth. MIDI, USB and CV connectivity. Panel is rather closely packed. No glide knob as standard. EMIS +44 0117 956 1855. Analogue Haven +1 310 451 7744.